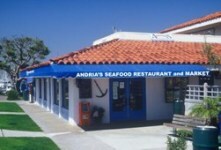 Andria’s Seafood Restaurant and Fish Market is located in the beautiful Ventura Harbor Village. Well known for our original Fish & Chips, homemade clam chowder, and casual family atmosphere, we provide the freshest seafood available, both in the restaurant and in the market to take home. We offer salmon, halibut, scallops, and fresh lobster, just to name a few. Open at 11am for lunch and dinner, seven days a week. Hours: Monday-Thursday 11am-9pm; Friday- Sunday 10am-10pm.